LearnMMD Stage is ready to Download! LearnMMD Stage created especially for LearnMMD by our friend, Trackdancer. 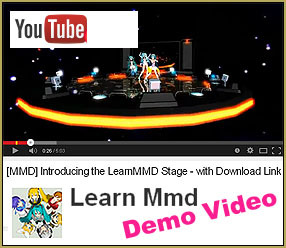 DOWNLOAD NOW from the LearnMMD Downloads Page. You will love this stage! 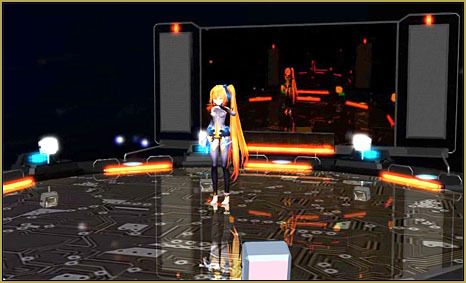 The stage has a mirrored floor, “lights” that work when you engage the AutoLuminous effect, a custom dark skydome with soft, distant “stars”/spotlights, an optional “meter” that displays VMDSpectrum data … and, what could be a “world-first”: a tinted motion capture screen! … or you can use the included “standard” screen. Looks so Professional … that you can imagine it installed at ground-zero inside Madison Square Garden, mid-field at the Super Bowl, or screen-center in your music video! You will want to install the AutoLuminous effect to “switch-on” those beautiful lights … and, behind the models in the Demo-Video you will see the sound-spectrum meter driven by VMDspectrum data; yet another new thing to learn! 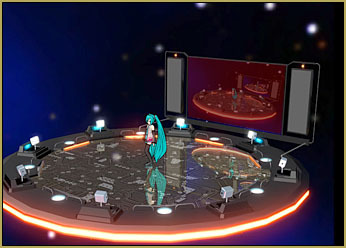 Trackdancer included an MMD “comic” to show you how to set-up your stage. There is an order of things … and a manipulation or two to be done as you get it ready to go. You will want to have MME, MikuMikuEffects, installed inside your MMD folder … get MME “in English” from our Downloads page. With MME, you can use the AutoLuminous effect to ignite the lights on your new stage. Download our stage and get started on your next hit video! Don’t forget to download the application for the VMDSpectrum. 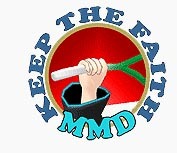 The URL is on the LearnMMD Downloads Page. … and READ THE VMD Spectrum Analyzer Instructions to create the VMD files you will need for the Spectrum device included with your LearnMMD Stage. How do you get that transparent working floor thingy? I used working floor a while now but I have no idea how to get it transparent. All I can do is fade it to white or black, depends on the backround colour. We now offer the VMDSpectrum program from the LearnMMD Downloads page.